If you have children or even other younger members who may use EZVideo it is highly recommended that you at least set up your PIN number for Parental Controls sooner rather than later. Parental Controls are accessed through the Settings. 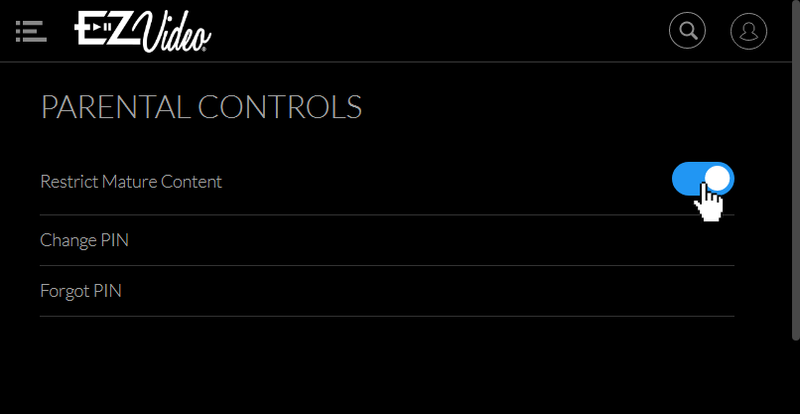 When you first access the Parental Controls menu you will be asked to create a 4 digit PIN. This PIN number will be used to restrict access to the Parental Controls and mature content. You can also change or reset your PIN from this menu. Mature content is described as: R, TVMA or NC17. NOTE: Content that is restricted by the Parental Controls settings will still be viewable through the Picture-in-Picture display. Parental Controls are predicated on the content being rated. On occasion, one may encounter some programming not rated by the content provider.